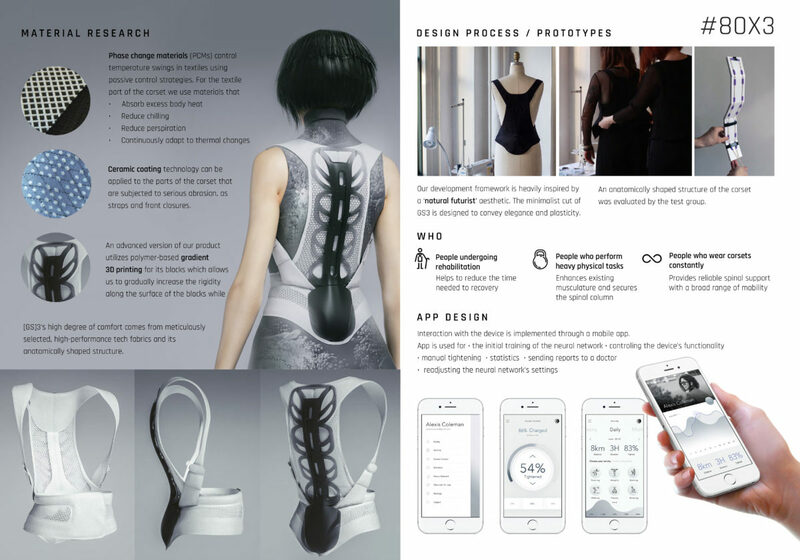 Graduated Spine Support System is a wearable device designed to provide dynamic back support. Using data assessed by an integrated neural network, GS3’s lightweight cable mechanism can easily and precisely adjust to the wearer’s rigidity and support level. Our journey began with a young woman, Polina, who lives with Connective Tissue Dysplasia. This condition causes joint hypermobility and chronic musculoskeletal issues that require daily spinal support. Not only did Polina’s old brace rest in a fixed position, it was also bulky and looked odd. This stigma significantly affects even the most basic moments of her life. GS3’s goal is to reinvent the orthopaedic brace so that people like Polina could have both spinal support with a broad range of mobility and look good while wearing it. We analyzed a number of restrictions and flaws in current products and found that they weighed too much, had limited freedom of movement, and used inefficient materials. Overall, the products were awkward, inconvenient, and unattractive. The research also pointed to a broader spectrum of potential wearers: clients who are undergoing physical rehabilitation and clients who perform heavy physical tasks. Beyond use in just the medical domain, our team’s objective is to create a prosthetic that can assist the natural functions of non-medical wearers by providing exoskeletal stability. GS3 enhances existing musculature and secures the spinal column to provide an adaptive ‘super power’ that can be utilized for people performing strenuous tasks such as moving furniture or working in a warehouse. GS3’s high degree of comfort comes from meticulously selected, high-performance tech fabrics and its anatomically shaped structure. 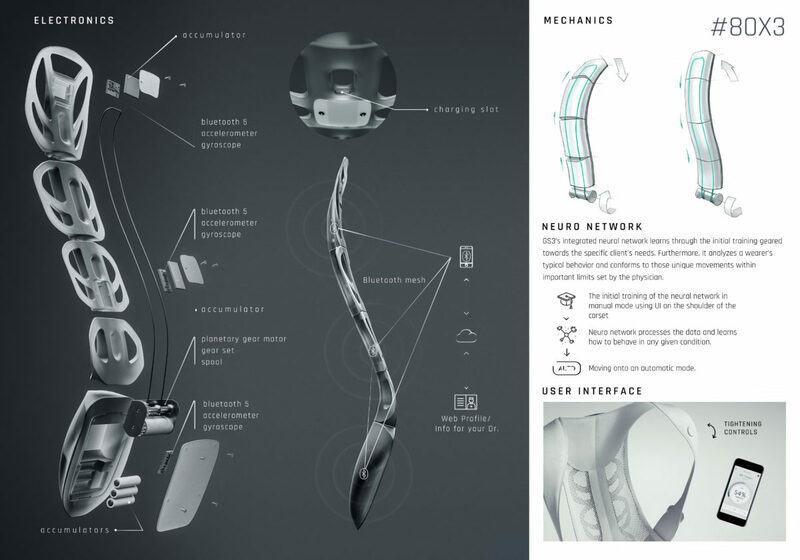 The flexible spine and smart behaviour are achieved by integrating the neural network with 3D-printed components. Physical rehabilitation can take many months to gradually rebuild muscle, so a patient’s needs will change depending on the stage of recovery. Over time, GS3’s neural network learns the wearer’s typical behavior and conforms to those unique movements within important limits set by the physician. Interacting with GS3 is easy thanks to our mobile app and a carefully balanced UX. While being a functional device, our corset is still a part of one’s outfit and should behave like a fashionable accessory. Our development framework is heavily inspired by a ‘natural futurist’ aesthetic. The minimalist cut of GS3 is designed to convey elegance and plasticity. We designed the corset to easily complement and blend into a wide array of fashionable looks. Our sequence of looks mixes luxurious, delicate textures with high-performance utilitarian materials. The core mechanism of GS3 is a cable system enclosed inside 3D printed movable blocks (detailed scheme is on the A3 board). An advanced version of our product utilizes polymer-based gradient 3D printing for its blocks which allows us to gradually increase the rigidity along the surface of the blocks while keeping the wider surface flexible. Data is sent directly from an array of accelerometers operated through Bluetooth mesh. Using this technology, each sensor sends its data to the processor without disrupting the other sensor connections. First, a user will be asked to perform the initial training of the neural network in a manual mode using a mobile app and UI on the shoulder of the corset. Subsequently, our neural network processes the data from the initial training and learns how to behave in any given condition. After that, the corset is ready to perform: for users like Polina, it provides maximum support throughout the day. For users undergoing rehabilitation, it helps reduce the projected recovery timetable. The corset connects to its Charging Stand to charge overnight. This stand charges both sensors’ and motor’s power supplies simultaneously. We take what typically looked at as a weakness in how body functions, and we highlight its new found strength. GD3 normalizes body enhancements. 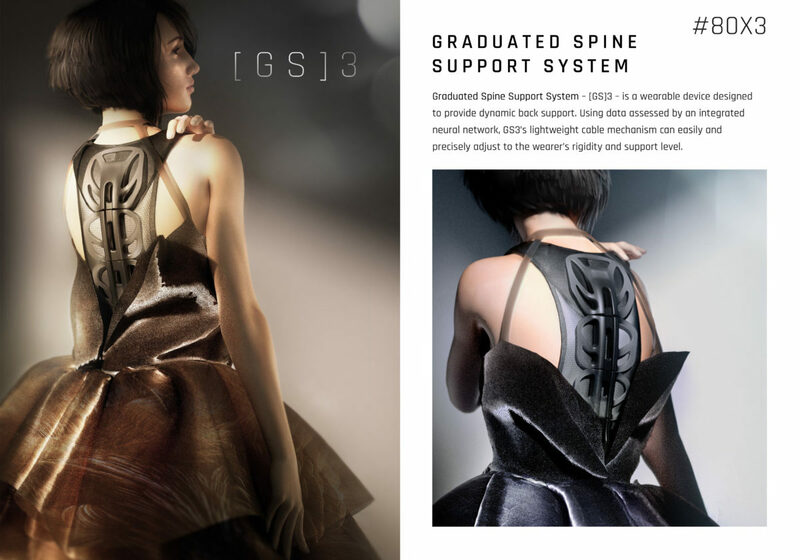 While marketing the device on the edge of medicine, fashion and technology, we believe that it is fashion’s responsibility to ensure that those who need to wear a Graduated Spine Support System can do so regularly and with comfort. Mobile app is an essential part of the device’s functionality. However, the corset is able to function without the app.